The focus of this recording project is to rediscover the representative century American saxophone sonatas in chronological order. The first documented American saxophone sonata was composed in 1928, thus narrowing the focus of this project from1937 until 1980. The first piece Bernhard Heiden composed for saxophone was Sonata for E-flat Saxophone and Piano. This Sonata was written in Detroit in 1937 for saxophonist Larry Teal and was published in 1943 by Schott & Co., Ltd. Since then it has become one of the most performed pieces in the saxophone repertoire. The piece has become a staple of saxophone literature because of the technique required to play the piece, the different creative elements used by the composer and the historical importance of it to saxophone literature. The forms employed in the three movements of Sonata are traditional forms, such as sonata-allegro and rondo, with twentieth-century variations. There is a great deal of thematic unity within each movement and across the composition as a whole. In addition to direct links between themes and motives as variations of one another, there are also figures that are related to each other as manifestations of a common, underlying musical idea, such as expanding intervals and ambiguity between major and minor tonality. 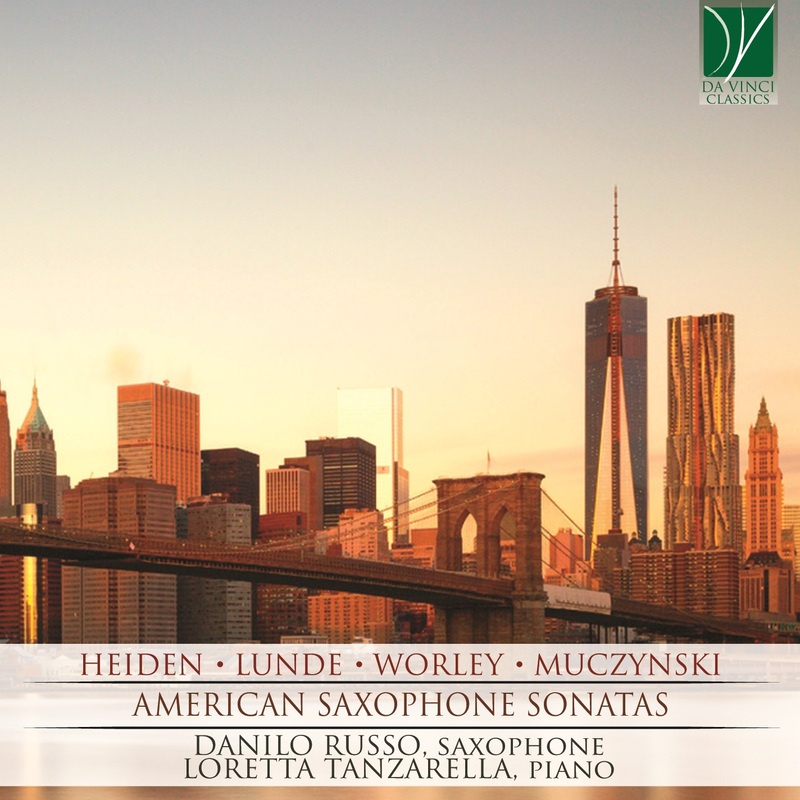 Heiden’s Sonata is a substantial work in both length and difficulty; it is a moderately difficult piece for both saxophone and piano that is approximately 15 minutes in duration. His writing for saxophone is idiomatic, but includes numerous technical and interpretive challenges. This Chicago-based composer and pianist wrote thirteen compositions utilizing the saxophone, and six of those works are sonatas. His compositional style features great lyricism and rhythmic energy. This three movement sonata was dedicated to Cecil Leeson and Brian Minor. The first movement begins with an a cappella fanfare in the saxophone that leads to the first theme. Lunde employs a modern variation of the traditional sonata form the elements of exposition, development and recapitulation are all present, though obscured somewhat by the composer’s penchant for melodic invention. Saxophonist Stephen Mauk has described the mood of the second movement as “sacred jazz”. The ternary form in the movement contrasts an initial hymn-like simple theme with a moody and modulatory agitato the serene ending in F major yields to the effervescent ABACABCA rondo finale of the sonata’s third movement. The playful nature of the writing is evident throughout, particularly when Lunde uses hocket to interject humor into the third rendition of the A theme. By far the most performed and popular of the composer’s six sonatas, this final work on the program was written in 1959. Profoundly American in each harmony and page is the first of the two Sonatas for Alto Saxophone composed by Worley respectively in 1975 and 1981. The first sonata is a concise composition that contains copious references to American and Russian music. It combines different images rather than real styles: in the first movement “with intensity” is easy to recognize the direct influence of Gershwin and first American composers, especially in the piano accompaniment. The second movement named “with contemplation” shows a great and warm cantabile that comes directly from the jazz of 70thies, becoming essentially a spiritual without words. In the third movement, we are back in Europe with a direct reference to Stravinsky where is possible to listen to a veiled allusion to some pages of the wittiest Shostakovich too. His two works for solo saxophone, the Sonata Op.29, and Concerto Op.41, are performed often and have become mainstays in saxophone recitals worldwide. In Jean-Marie Londeix’s A Comprehensive Guide to the Saxophone Repertoire the author states that: ―Muczynski’s music is very melodic in an Aaron Copland fashion and very rhythmic and percussive— an American Béla Bartok if you will. The unique combination of these two disparate styles along with the regular use of jazz harmonic structures combines to create Muczynski’s style. Originally Muczynski fashioned the two movement work with a more evocative title in mind: Desert Sketches or Desert Serenade. The opening melodic line in the saxophone part of the Sonata Op.29 presents the germ cell that is developed throughout both movements. All of the melodic material in the first movement’s ternary form flows organically from this idea that is restated dramatically in the saxophones altissimo range then transformed into a 5/8 Gershwin-like jazz riff. The movement closes with an austere sotto voce sounding of the opening theme. In terms of content and character, the second movement is its complete antithesis: a driving toccata, alive with syncopation and rhythmic intricacies, and which proceeds with minimal uncertainty to a dynamic and also decisive conclusion. The second movement opens with a driving rhythmic figure that frames an altered sonata-rondo form based on a dissonant harmonic underpinning of parallel major-seventh chords that give this movement a feeling of raw energy. The coda transforms the opening thematic material into a scintillating 6/8 that closes the sonata with dramatic style. It is as entertaining for the audience as it is challenging for the performers. DANILO RUSSO: He began his musical career when he was five years old, mainly because his mother was a pianist. He began studying the saxophone at the age of eleven and graduated with honors at the prestigious Conservatory of Music St. Pietro a Majella, in Naples, under the guidance of M° Francesco Salime. He won numerous prizes as a soloist. In particular he won first prize in the competition G.Curci, and also the first prize in the competition A.M.A. Calabria. He had the distinction of a unanimous Special Mention at the exhibition Growing with Music Preludium of Sanremo 1999 and also a mention in the international competition of Gap in France. He found similar success in competition in chamber music: with the quartet of Saxophones Majella San Pietro in Naples, winning the first prize in Chamber Music Competition of Pignataro Maggiore, the second prize in the competition for chamber music the Golden Mile and the second prize at Chamber Music Competition AMA Calabria at Lamezia Terme. Since 1999, he began a fruitful and close collaboration with the Orchestra of Santa Cecilia in Rome, which has seen him taking part in numerous recordings such as “A Blue America, Musicom” associated with the newspaper La Repubblica and directed by WYChung. In 1999 he was involved with the CD-ITALY to commemorate the 50th Anniversary of the German Republic, in collaboration with the Academy of the Berlin Filarmoniker. Again with the Orchestra of Santa Cecilia has performed in numerous concerts with soloists and conductors working class such as S. Bollani, W. Marshall, Y. Temirkanov and recording various events for RAI television and radio. In particular, he participated in numerous concerts with E. Morricone, including the Concert for Peace 2004 in the presence dell’Emerito C.A.Ciampi, President of the Republic of Italy. Now he is a member of the Saxophone Ensemble “F. Salime” for whom he has performed numerous concerts both in Italy and abroad, participating in the May 1999 Brass Festival in Rimini Italy, and also representing the XI World Saxophone Congress in Valencia in Spain and the XII World Congress which was held in July 2000 in Montreal, Canada. In addition, in Montreal, he took part in a series of concerts at Calabresi associations in Canada and the International Festival of Lanaudier, premiered “Appel” which was a track for 100 saxophonists, in collaboration with Ensemble de Saxophones de CNSM de Paris, The Northern Arizona University Saxophone Ensemble, The University of Southern Mississippi Sax-Chamber Orchestra, earning much acclaim from many critics and audiences. As well as being a Saxophonist, he also conducts and teaches at several music schools and he is an accredited Saxophonist at state schools where he teaches music. In the field of education, he has worked to adapt the “Thematic Studies” by D. Semeraro (published by the Editions Volonte & Co). Some of my works for saxophone quartet are published by Glissato Edition. He is also able to conduct and, as Director of Calliope Wind Chamber Orchestra, he has to his credit numerous concerts and participation in national festivals, including the “Festival of the Strait of Reggio Calabria” and the International Festival “Valle D ‘ Itria “Cisternino (Brindisi). He also gained second prize at the 2008 competition AMA Band Calabria at Lamezia Terme (CZ). Again with the Calliope Orchestra he has recorded the CD “Calliope Wind Chamber Orchestra with Donato Semeraro,” published by Editions Eurarte, Varenna (LC) and the “CD Fulget Dies” published by Scomegna, La Loggia (TO). LORETTA TANZARELLA: Born in the enchanting white city, Ostuni, she became very young in the world of music, in 2006 she graduated under the guidance of M ° Stefania Santangelo, after the high-level course at the Music Academy of Pescarese of Maestro Paolo Bordoni. The study of the chamber repertoire, a field that sees her engaged in different formations, supports the study of the purely piano solo repertoire. He has obtained excellent results in several national and international competitions, winning the first prize at the 11th National Music Competition in Ortona with the saxophonist Mariella Donnaloia, at the 7th European Music Competition in Altamura and the first overall prize in the Duo category chamber at the "Città di Matera" National Competition. He is a pianist for European and international competitions, for master classes including the one held in Pescara in October 2012 with M ° Michael Lind, Principalist of the Royal Philharmonic Orchestra of Sweden since 1975 and teacher at the Royal Swedish Academy of Music since 1980. In June 2013 he is master of the masterclass held by M ° Jean-Yves Fourmeau, heir of the French school of saxophone and teacher at the Cergy-Pontoise Conservatory, and with whom he held a closing concert of the master playing music by Desenclos and Tomasi. In 2013, 2014 and 2016 he is a piano accompanist of the masterclass held by Maestro Francesco Di Rosa, the first oboe of the Accademia Santa Cecilia. In the final days of the course he accompanied M ° Di Rosa in the final concerts held in the hall of the "Nino Rota" Conservatory of Monopoli playing music by Schumann, Poulenc, Saint Saens and Rota, Hindemith and Mozart. Since 2015 he is within the Yamaha circuit as a teacher of the Yamaha Music Foundation. He is also pianist of the coro Iubilate of Conversano conducted by M 'Donato Totaro with whom he performed, among other things, Mozart's Requiem and Vivaldi's Gloria. Bernard Heiden (b Frankfurt am Main, 24 Aug 1910; d Bloomington, IN, 30 April 2000). American composer of German birth. He studied with Hindemith at the Berlin Hochschule für Musik (1929–33) and in 1935 moved to the USA. In 1941 he became a naturalized American. He studied musicology with Grout at Cornell University (MA 1946). Later that year he was appointed to the music school of Indiana University, eventually becoming professor of music and chair of the composition department; in 1981 he became professor emeritus. He was the recipient of many awards and commissions, among them a Guggenheim fellowship (1966–7) and an NEA grant (1976). Heiden's music is neo-classical in its formal structure, the early works portraying the influence of his teacher, Hindemith. Strongly polyphonic in texture, his prolific output, especially in the genre of chamber music, demonstrates a mastery of sonorous balance and effective instrumentation. He made an important contribution to the solo sonata and concerto repertories, writing for many relatively-neglected instruments like the horn, tuba and viola. His Sonata for viola and piano (1969) is intensely lyrical, with clear contrapuntal writing and chromatic melodies. The Sinfonia for wind quintet (1949), a staple of the woodwind repertory, employs modal harmonies, accentuated by the lyrical shapes of his melodic lines and sonorous voicings. In his vocal music the melodies are often free and daring (as in the Sonnets), while never obliterating the text. Unlike other composers, he did not take part in the postwar avant-garde movement but remained true to his own musicality.